10 round washable wipes in organic cotton complete with an organic wash bag to keep them in order in your washing machine. Organic reusable makeup wipes and an organic cotton wash bag. This is the perfect kit for removing your makeup. 10 round washable wipes in coloured organic cotton complete with an organic wash bag to keep them in order in your washing machine. All washable up to 60'. These Round wipes measure 3" across, so are a good size for cleaning your face as well as your eye area. 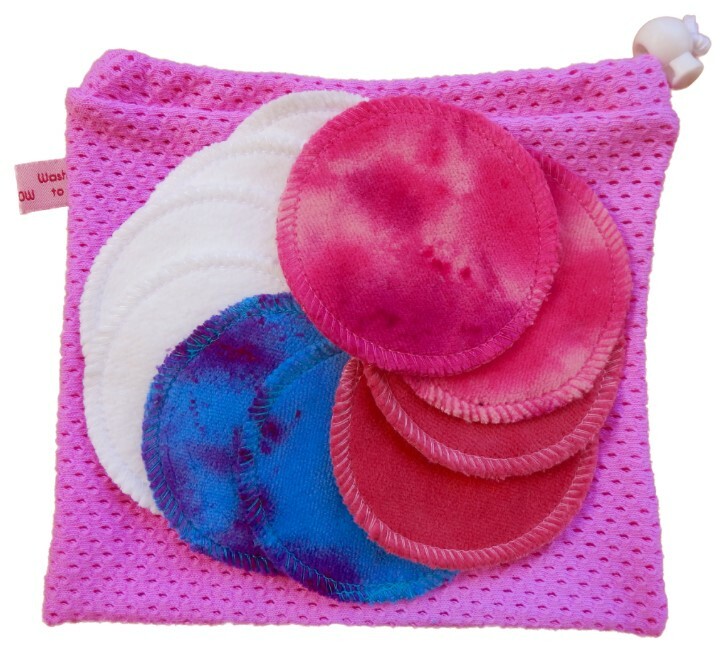 Unlike our semi-circular Makeup Wipes, these Round ones are finished off perfectly, so they don't have the dangling threads you can sometimes have on the other ones. The Wash Bag with this set is made from organic cotton.